Fresh flowers can bring life to your table or home décor. With so many varieties available, you can create gorgeous centerpieces for your home or save some money by doing arrangements for a party or special occasion yourself. With a few tips and a little practice, you can pull off some one-of-a-kind fragrant pieces that suit your own style. Here are a few tips and tricks for finding the right flowers and for preparing, arranging, and caring for those flowers. Lucky for us, my family lives near the Los Angeles floral district. Floral districts offer a variety of inspiring, fresh-cut, wholesale flowers and greenery. You can peruse shops at your leisure to find the right fragrance, color, shape, and size. If you don’t live near a floral district, check discount superstores, such as Sam’s Club or Costco, for inexpensive flowers. They usually have a good selection at reasonable prices. Choose both large and small flowers in various shapes, textures, and lengths. Pick flowers that are similar in color and hue for a monochromatic bouquet. Consider picking some flower fillers, such as baby’s breath or other assorted greenery. Once you have chosen your flowers, put them in lukewarm water mixed with a floral preservative (flower food) as soon as you get home. This preservative typically comes with your chosen bouquets. It will help reduce bacteria, keeping your flowers healthy. You can also make your own flower food with a tablespoon of sugar, a tablespoon of white vinegar, and a quart of water. Another recipe for flower food calls for mixing a citrus soda, like 7-Up or Sprite, 50/50 with water. Carefully remove all the wrapping and cut off the rubber bands. Using a sharp pair of flower shears, make a fresh cut and trim about an inch off the bottom of the stems. I like to cut the stems at a 45-degree angle to help prolong their lives. Leaving them in lukewarm water will help the flowers absorb the water better. Leave them in the water for a couple of days before you start arranging them. Before you arrange the flowers, make sure you are seated with the arrangement at eye level. This way, you are at a good angle for creating an even arrangement. If you are dealing with flowers with thorns or sharp edges, consider wearing rubber or garden gloves. You can remove thorns with a sharp knife at an angle or clippers at the base of the thorn. Next, make another fresh 45-degree angle cut before you put the flowers in your arrangement, and trim any leaves that will be submerged in water. Leaves that stay in water have a tendency to rot, contaminating the water and allowing the flowers to die quicker. Start your arrangement with floral foam or a flower frog to keep the stems in place and stabilized. Flower frogs come in handy when your container is shallow or low. They can also help keep the stems away from the edges of the container so they don’t scratch your vase or pottery. If you don’t have a flower frog, you can use chicken wire; you can also use floral tape in a crisscross grid pattern. If you use foam, make sure you water the arrangement every couple of days. Depending on where you place your flowers, consider whether you need to build your bouquet vertically or horizontally. For horizontal arrangements, use a shallow vase or container. You should also think about the shape of your arrangement (oval, triangle, etc.). 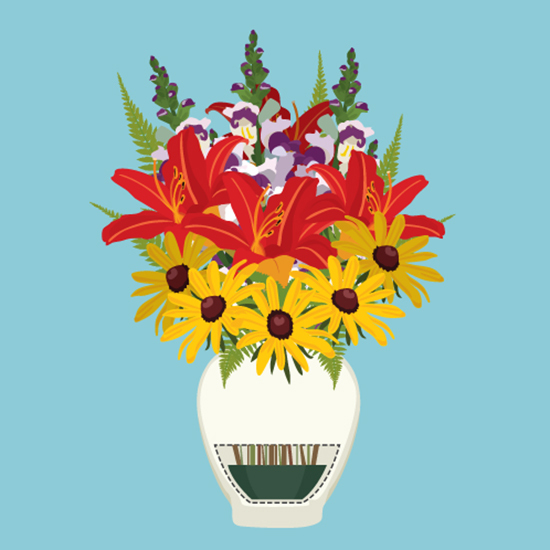 For vertical arrangements, make sure the flowers are at least 1.5 times the height of the vase or container. Large-scale arrangements can have an interesting effect, but make sure they are proportional to your container. Start by placing the large flowers towards the center and the small flowers in the outer areas. For a symmetrical arrangement, cut the stems gradually shorter as you work away from the center. You can fill in your arrangement with foliage, extra stems, or leaves, depending on the season. Several low-cost varieties of flower fillers are available. As you build, take a step back every once in a while to make sure no empty spots or holes need to be filled. For narrow, tall arrangements, use a rubber band to hold the stems together and keep the bouquet in place. Use creative recycled containers. A floral arrangement doesn’t always have to go in a glass vase or a pot. I like to use recycled containers or those I find at thrift stores or flea markets. Consider using vintage water pitchers, your grandmother’s milk glass, a vintage tin, Mason jars – you get the picture! However, make sure these containers are thoroughly cleaned out to keep bacteria and other microorganisms from infecting your flowers. Don’t forget about embellishments, especially if your arrangement is for a wedding or other special occasion. When arranging your flowers, you can easily implement beads, feathers, butterflies, burlap, and other materials. Keep the season and occasion in mind when choosing the right additions. Keep the flowers away from direct sunlight or any other sources of heat. You should also keep them away from drafty or breezy areas. You can re-cut the stems and change the water often, even daily. Make sure you remove debris from the water and remove any wilted flowers to avoid contamination. Don’t forget to replenish your flower food when you change the water. You can trim the stems every three days. As you begin arranging, keep it simple. Practice makes perfect. If you feel overwhelmed, sometimes choosing several small containers and grouping them together can make a beautiful arrangement as well. Pick three of the same containers and place them in a row, or choose three containers with similar widths and differing heights. Groupings in odd numbers look best.